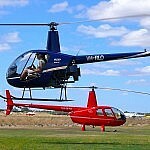 Arrive in style in your own private helicopter from Rotorvation Helicopters. Incredible visibility and stunning views of historic Fremantle, the southern beaches and Rottnest itself make this the ultimate way to get to the Island. Flights available seven days a week from Jandakot Airport. Includes return flight and three hours on the Island. Extra time can be arranged for a small fee. The flight time including the return trip is approximately 40 minutes. Three hours helicopter standing time allows you the opportunity to explore the Island or enjoy a leisurely lunch at one of the Island’s excellent restaurants.